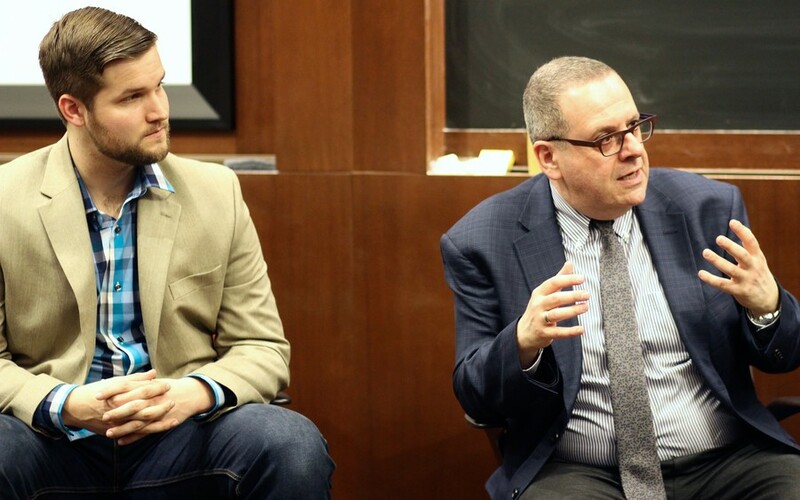 On Tuesday night in Saieh Hall, the Intercollegiate Finance Journal at UChicago hosted “Opera-nomics: The Business of Opera,” a panel discussion on the economics of opera. Co-moderated by second-year Eric Li and third-year MJ Chen, the panel brought together the general directors of two Chicago-based opera companies: Anthony Freud of Lyric Opera of Chicago and Daniel Grambow of the Floating Opera Company. The panelists represented different extremes of the operatic landscape. Based in the Civic Opera House, Lyric has been a Chicago mainstay for more than 60 years and has an annual operating budget of about $75 million. Floating Opera, which performs in venues throughout the city, was incorporated as an LLC last year and had an annual budget of only $25,000 its first season. Freud admitted that, as the general director of the second-largest opera company in the United States, he envied the “flexibility and nimbleness” possible in smaller companies like Floating Opera, especially given the general decline in ticket sales and subscribers for opera over the past 50 years. “[Lyric is] rather monolithic in arts organizational terms, in that it has a very large, inflexible overhead that plans four to six years in the future,” Freud said. On the other hand, Floating Opera is, in Grambow’s words, a “professional development company” which attracts young, employable singers new to the Chicago area. Though Floating Opera holds standard repertoire at the heart of its programming, there’s little that’s “standard” about its productions, which are often held in unconventional venues. A recent example was the company’s Don Giovanni, which was staged in the Bohemian National Cemetery on Chicago’s North Side. Upon the conclusion of the opera’s run, Floating Opera donated $1,000 of total ticket sales back to the cemetery, which is recognized as a National Register of Historic Places site. Freud pointed out that the community engagement Grambow described contrasts markedly with so-called “outreach” by larger companies. He noted with relief that arts organizations are shying away from framing their community involvement efforts as such. To that point, Freud and Grambow agreed that an opera company of any size must have this strong sense of identity in order to realistically assess what it can and cannot do. Though some naysayers viewed New York City Opera’s fate as indicative of a greater decline in opera, both Freud and Grambow rejected the notion that the art form was in grave danger. “I think it’s impossible for opera to die, because there are so many people [out there] who are making it continue,” Grambow said.